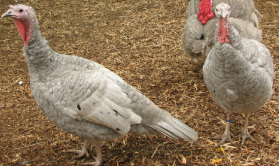 The Slate turkey was one of the first varieties to be admitted to the American Poultry Association Standard, in 1874. The feathers are a slaty or ashy blue, and may be dotted with black. When breeding Slate to Slate, 3 colors are produced: Slate (50%), Lavender or Self Blue (25%), and Black (25%). 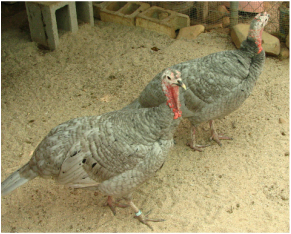 I do not keep a Slate tom, preferring to use a Lavender or Self Blue tom over Slate and Lavender hens to avoid getting the black color. 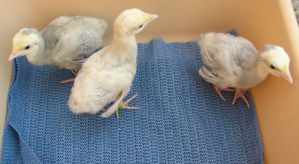 Breeding Slate to Lavender produces 50% of each color. 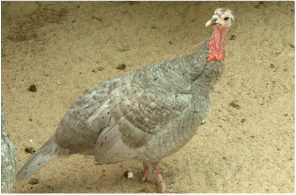 This is a black based turkey. When one dominant slate gene (Dd) is present, as in the Slate, the black is diluted to a slaty or ashy blue. When the dominant slate gene is homozygous (DD), as in the Lavender or Self Blue, the black color is diluted to an even paler slaty blue. The Slate genotype is BBDd. Due to the death of my Self Blue tom in 2017, I will be using a Barred Black over my Slate and Self Blue hens in 2018. 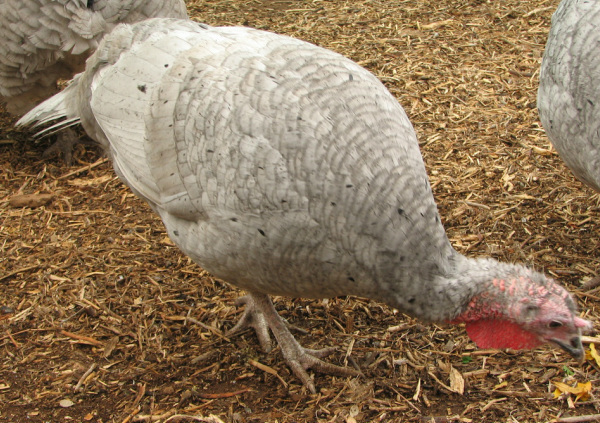 A percentage of pure Slate will result and can be told apart from the poults carrying the b or bronze gene.